That’s what Using Our Words is all about. The truth of those moments. Finding someone to share a laugh, even when reality brings us to tears. Or finding someone to cheer for us when we reach those oh-so-coveted highs. 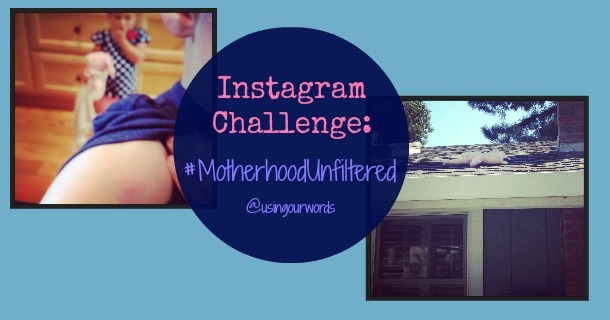 In that spirit, I’m starting an Instagram challenge. While I’m no professional photographer myself, I do think that pictures can capture these raw parenting moments in a way nothing else can. The good. The bad. The tantrum-in-the-supermarket ugly. I’ve heard criticism that social media gives parents the chance to edit their reality. To focus on the “perfect” moments, rather than the “real” ones. While I’ll be the first to say that some of those perfect moments are real — and absolutely worthy of celebration — I know that there are other moments during the day that are just as memorable and relatable. Next Thursday, June 13th, I’ll write a post featuring some of my favorite pictures from the challenge. If it goes well, I’m make this an on-going challenge/feature. It’s just another way that we can have a bit more fun on this parenting journey together.